More than half of respondents to this week’s RBJ Daily Report Snap Poll favor the four-story residential and commercial structure concept submitted to city officials for mixed-use development at the Port of Rochester. Submitted in response to a city of Rochester request for qualifications, the proposal—from Morgan Management LLC of Perinton—calls for a four-story structure with 200 apartments and nearly 7,000 square feet of retail space. 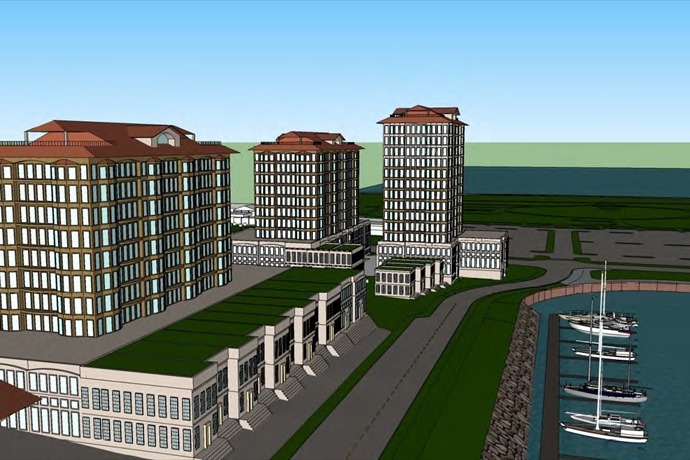 The other response was submitted by Edgewater Resources LLC of Michigan; its proposal includes a 13-story, 96-room hotel and an 11-story residential and commercial structure. After reviewing the two proposals, the city selected Edgewater to develop a final design. The firm’s officials say the final design will be developed over the next eight months, and they plan a series of meetings to gather public input. The Morgan concept was favored by 58 percent of Snap Poll respondents; 21 percent preferred the high-rise design outlined by Edgewater. The mixed-use development will be on nearly three acres east of Lake Avenue and overlooking the Genesee River and Lake Ontario. It is part of the waterfront revitalization that will include a new 85-slip marina. Roughly 820 readers participated in this week’s poll, conducted April 28 and 29. In general, which of the design concepts submitted to city officials for mixed-use development at the Port of Rochester do you favor? The Charlotte area can be a beautiful region, and thank goodness something is finally being done about that. However, I do not support a high-rise hotel. I feel that would only detract from the region, sticking out like a sore thumb. Scaled-down version would be much more attractive with accompanying retail space, shops, restaurants, etc. What disappoints me more is that Lovely Warren hires an out-of-town firm to spearhead this project! What about keeping the jobs in Rochester? So much for job creation here. The high-rises are like the fast ferry: too big, too expensive and a future liability for city taxpayers. I guess we didn’t learn our lesson the first go-round. The reason I favor the four-story concept is because I developed it. My firm did extensive market studies, considered what the Charlotte merchants and residents wanted, and then gave the city of Rochester the largest real estate developer in the region to do the project with conventional financing. They decided to choose a developer that has never developed anything and will look to foreign investors through EB-5 financing to support a project that locals hate. The idea of a hotel down at the Port of Rochester is too much of a stretch for me. Is it a high-rise hotel so that most of the rooms get above the smell of the algae? The way to get businesses to locate to the port is to get a minimum of 10,000 people to live there. The four-story residential and commercial structure brings the most permanent residents to the port. There should be a large boardwalk or right of way, as well, so that the view of the lake and the river is as unobstructed as possible. High-rise buildings would look hideous along the lake. The four-story building doesn’t overwhelm the beautiful neighborhood and fits in nicely along the river. Where are the people who would pay over a million? Who will stay in the hotel? What a disaster that will be, and it’s harder to move than the fast ferry fiasco. The four-story mixed-use structure plan was much more in keeping with the style of Charlotte and was reminiscent of the structures that existed at Ontario Beach at the turn of the 20th century. These plans were not shown to Charlotte residents until a day before Rochester Mayor Lovely Warren announced that her administration had chosen the Edgewater plan. Every single Charlotte neighbor I have spoken with prefers the four-story structure over the high-rise hotel and has expressed anger and frustration that the decision was made without regard for input from residents (taxpayers) of the Charlotte community. Who is going to live there? Hopefully not the same people who were supposed to ride the fast ferry. The development of this property should have low-profile buildings to not (intrude) on the view of the lake or the river. I would prefer a development that reflects the history of Charlotte. I would like to see an ice-skating rink, a trolley service, small shops such as they have at Olcott Beach. The city never took into consideration the historic aspect of the village of Charlotte or its residents’ concerns. Like the “fast ferry” debacle, impractical ideas and plans of grandeur do not touch on the reality of the area’s actual needs. The planners and decision-makers have no clue to what the Charlotte neighborhood is really all about! I would model after the success of Corn Hill in regard to three- to four-story apartments. Corn Hill has dining and retail options without overwhelming the historic district and surrounding neighborhoods. The Port of Rochester is a tremendous asset with unique neighborhoods with a lot of potential and some nightlife. Build to bring people there in both the summer and the winter. Why is this city so intent on building brand-new neighborhoods while rezoning the destruction of gems, like the Highland Park neighborhood? —Jim Antonevich, Metrix Matrix Inc. Cleaning up the environmental disaster around Ontario Beach should be the main priority. Until such time that you can walk or swim in that area without being overwhelmed by the noxious odor and bacteria-sickened water, there won’t be meaningful traffic and commerce. The Charlotte area investment should be focused on beach use, recreation and other public use space. There is no need to pollute the water and park area with more buildings. Same opinion for the development in Canandaigua. You simply cannot make a silk purse out of a hog’s ear. Enough said! While I can see the attraction of a high-rise, my concerns would be: Loss of sight lines from the neighborhood light pollution—how much shadow does a 13-story building cast? I'd bet a big one. Traffic: I do find it amusing that this proposal was created while the potential street narrowing of Lake Avenue was also in the works (traffic-calming). Does Lake Avenue have capacity to handle what will be created in new traffic? Growing up in Charlotte, I believe the high-rise hotel and residential proposal is way out of scale for the area. It will further limit public access to the river and lake as well as take up most of the parking space at Ontario Beach Park. I think a more modest development that enhances the natural beauty of the area would be more consistent with the character of Charlotte. Build it, please! Make it big, bold and beautiful—just like we used to do. Rochester has the least developed and underutilized waterfront on the Great Lakes! Why is this community so afraid of development? Be brave Rochester, just like are forefathers. —Antonino Barbagallo, Antonino Barbagallo Photography Inc. When traveling to other cities with beautiful waterfront developments, the focus is on quaint shops, cafes and restaurants. The hotels and residential structures were secondary and most often set back away from the shops and cafes. I'm afraid until there are reasons for people wanting to relax and hang out along the waterfront, hotels and residential structures are premature and may become useless eyesores. Above all that, the water, beach and riverfront must become clean and attractive again otherwise it is all going to be a waste of time and money. The four-story residential/commercial rendering seems more in line with the character of the area and promotes a year-round community of activity. Both of these developments, mixed-use or otherwise, are nothing more than boxes plopped down on a vacant lot—looking exactly like so many other building projects in Rochester. They have no integration of inside/outside. No outside communal spaces. Not a deck or porch insight. This was a beach community. These buildings are cookie cutter and show no sensitivity to the lake/river front site. Urban planning is having a vision, not just letting developers control your community, which is obviously the case in Rochester. Will we never learn? This feels like the Ferry 2.0. The neighborhood association is against a high-rise project. They should have a complete voice in what takes place in their neighborhood (and) community. I favor progress in the port area, and while neither really seems "great" to me, I will support the effort regardless when it gets started. I do wish the mayor would listen more to the folks who run Charlotte, though. An unfortunate casualty of this is that the construction has bumped the RibFest out. We want this type of activity in Charlotte so this is not a good thing. First comes residential space, then unsubsidized retail development will follow. A hotel is perhaps fourth or fifth on the list after a casino or other high-end entertainment is in place to support a hotel. Monroe County squabbles over casino locations, while attractive commercial sites near water and near attractive recreational activities go undeveloped. Worry about a hotel that no one needs? What do I go to Abbots for an ice cream cone and spend the night at a hotel? Get real, Monroe County. Please do not build those proposed high rises. I favor any design whose benefits are limited to a short-term tax abatement for property tax only. No loans, or cash to the developers, or any other improvement incentives. Let the project stand on its own. Any property tax abatement should expire within five years so that the town can more easily recoup the infrastructure costs of improving the surrounding facilities to support the new development. Let's develop our waterfront property sensibly and profitably. While some development is inevitable and has some merits, it is important to maintain some of the character of the area. The most important thing will be to maintain/enhance public access to the waterfronts (lake and river). Why on Earth are we sending our dollars to an out-of-state firm to build a monstrous behemoth of a complex for which there is little demand? The Michigan firm's proposal flies in the face of smart, human-scaled, environmentally and economically appropriate urban development. The lakefront area does deserve investment and smart development; however, we should be contracting with the local firm—a firm that not only will keep the dollars and (short-term construction) jobs local, but also understands our economic environment and is not proposing to overbuild just for the sake of making a bigger buck. I think 13-story buildings in the port area would overshadow the general nature of the area. The lower four-story complex would be more in keeping with the other current structures. I'm also concerned about the failure of a larger undertaking. The city doesn't have a great track record in this type of development. Whatever is done, I think we need to show that there will be a market for it, and that it won't negatively impact other areas. Last I knew, Rochester is not growing. —Margie Campaigne, Energy Services Outreach for Graves Bros.
5/2/14 (c) 2014 Rochester Business Journal. To obtain permission to reprint this article, call 585-546-8303 or email service@rbj.net.